WHEN: Friday, August 3rd, at 9:15 pm and Saturday, August 4th at 6 pm. TICKETS: Tickets can be obtained through this link or by going to www.jerseyfringe.com. In 2017 at the Capital Fringe Festival in Washington, DC, "COMEDIAN ELECTED TO TOWN COUNCIL IN NEW JERSEY” was nominated for Best Comedy Performance. This great review appeared in BroadwayWorld-DC. Joey Novick returns home to the Garden State in August for two shows. Joey Novick has been a political comedian, camp counselor, editorial director, professional speaker, attorney, busboy, professional speaker, child actor and an elected official. “But not necessarily in that order,” Novick shared. 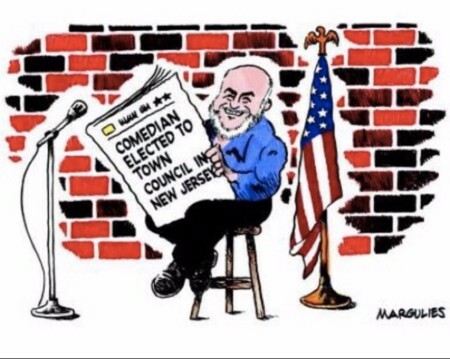 “COMEDIAN ELECTED TO TOWN COUNCIL IN NEW JERSEY” is the story of Novick’s election to the Flemington Borough Council and journey in local politics in the Garden State. As a stand-up comedian, he’s appeared at Bananas Comedy Club, Dangerfield’s, the Comedy Cellar. He’s opened up for Robert Klein, Rosie O’Donnell, Chris Rock and Ray Romano. He's also appeared in New York City at SideShow Goshko, The Liar Show, Mostly True Things and at the New Jersey Storytelling Festival at the Grounds for Sculpture. “COMEDIAN ELECTED TO TOWN COUNCIL IN NEW JERSEY” was developed in workshop with comedienne Carole Montgomery (Project Development); additional material developed by comedy writer for The Arsenio Hall Show Marty Rudoy (Creative Consultant) and directed by improvisational comedian Marshall Stern. Artwork for logo by cartoonist Jimmy Margulies. “I started out in politics very jaded and cynical, and after fifteen years, have evolved into being passionate about public service, America, and the future of our very fragile democracy,” Novick continued.